Pixar and Disney have been working together for years churning out hit after hit. 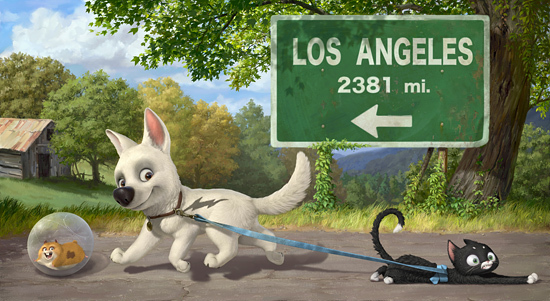 In 2008’s ‘Bolt’ Disney goes it alone with time around releasing an animated film under Walt Disney Studios. 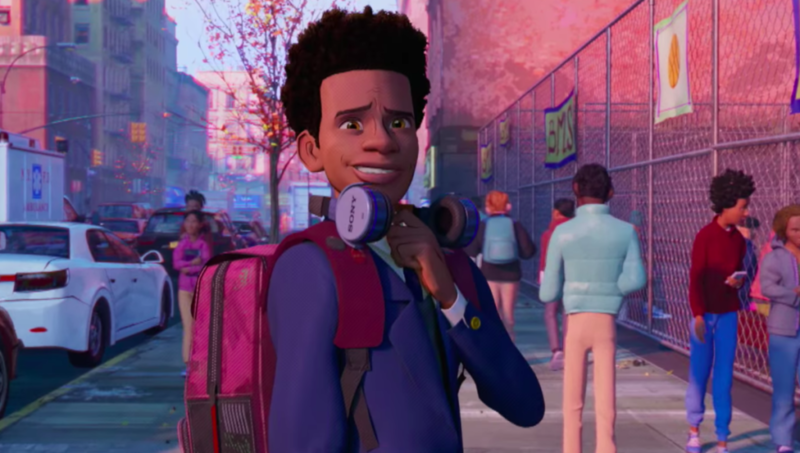 What makes this release so ever great on top of it being a great animated film for the whole family is that the Blu-ray version also comes with the DVD version of the film. This works out great for me as my kids can view the DVD anytime since the main TV encompasses the Blu-ray player. While Walt Disney Studios has geared their films toward the younger audiences, ‘Bolt’ is a film that can be enjoyed by the entire family. Bolt (John Travolta) was adopted from a pet store as a puppy by Penny (Miley Cyrus). He was used as a super-hero canine in a live action television series, starring as a dog with super powers. The entire opening sequence is really neat that it catches the viewer off guard. Penny loves Bolt very dearly and the same could be said about his love for her. One day Bolt believes that Penny is in danger by the villains from the television show. Bolt escapes from the trailer he stays in and ends up away from the studio and into the real world. 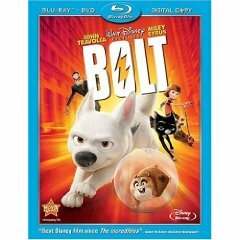 Bolt ends up getting shipped off to New York City. The problem is that once in the box, he realizes that he has lost those super powers he once had. He believes that the loss of powers goes to the packing peanuts that are packed in the box. He is not on his own though, he gets some help a new found friend through some force, a hamster, by the name of Rhino (Mark Walton) and they meet a street-tough kitten, Mittens (Susie Essman). They help Bolt find his way back to Hollywood and to Penny who he misses. 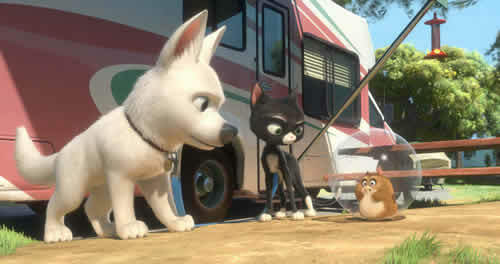 The story in ‘Bolt’ isn’t anything brand new and pretty much follows many Disney films to the tee. An animal, pet, or friend are lost by going off in a direction that they are not supposed to be heading in and then must find their way back. The great thing about this film is that it tells a tale about maturity, responsibility, and learning to cope with misunderstandings. The print is presented in 1080p/AVC MPEG-4 with a 1.78:1 aspect ratio. This has to be one of the most vivid and colorful animations on Blu-ray. Due to the colors popping off of the screen, it brings out the details in the animation. Some good examples of fine details, look at Alex’s fur coat, you can see individual strands of hair. This has to be one of the cleanest and most pristine animated films that I have seen. The audio is presented in DTS-HD MA lossless 5.1 mix. This mix takes advantage of the soundfield in this film. The soundtrack and sound effects can be heard coming from all around as this is one dynamic audio experience. At times animations tend to be more dialogue driven with lack of atmosphere. Dialogue is clean and center with no balance issues. “Super Rhino” [HD] – Rhino the hamster gets the spotlight in this animated short. Deleted Scenes [HD]– 2 scenes total. “In Session with John Travolta & Miley Cyrus [HD]– Interviews with both stars as they get ready to sing the duet. “A New Breed of Directors: A Filmmakers’ Journey” [HD] – directors discuss what it was like to make “Bolt”. “Creating the World of Bolt” [HD] – art director Paul Felix and lighting director Adolph Lusinsky in details. Overall, through all the cliches, and slow scenes, and despite all my expectations, my family and I actually loved this movie. There are of course several tear jerking scenes as Bolt discovers he is just a dog, the truth about Mittens and when he thinks Penny doesn’t really love him. I highly recommend this film on Blu-ray with superb video and audio quality. I watched this in theaters and it is very good. 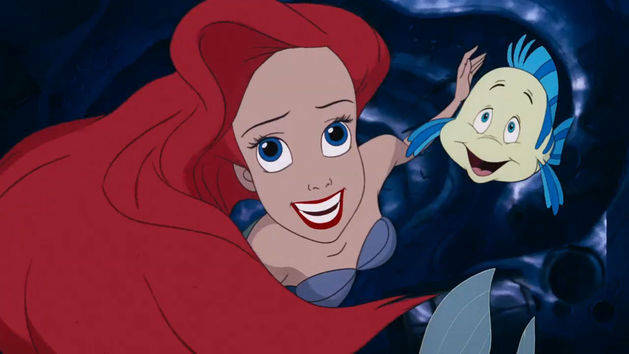 Pixar didn’t work on the animation, but their studio heads worked alongside Disney to get the story up to their standards. So, if you like Pixar films, you should expect to enjoy this film. 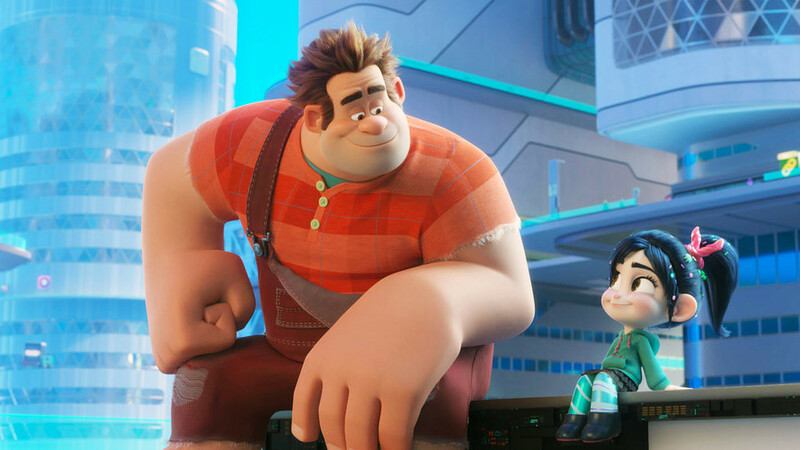 It’s got a lot of Pixar’s atmosphere and humor in it. The only bad thing about this Blu-ray release (unless I overlooked it) is no 3-D glasses. I watched the film in 3-D and it was visually stunning. Why not have that option for the kids that want to watch it at home? I thought this movie was good but not as good as Kung Fu Panda or Wall-E. I thought the visuals were better in those other movies as well. It’s going to be finish of mine day, however before ending I am reading this great post to increase my knowledge. Fantastic beat ! I would like to apprentice while you amend your website, how can i subscribe for a weblog website?